Russia was founded in the Ukraine. It was founded in the Ukraine (NA UKRAEENYE), not in Ukraine (V UKRAEENYE) not once, but twice, and both times for the same reason. Russia is not a word in Russian or any other Slavic language. The Rus were a subgroup of the Varangians, known today more commonly as Vikings. The lands that the Rus first occupied in today’s northwest Russia were rich with wildlife, fish and game, and they were close to the Rus ancestral homelands in Scandinavia, but they had no clearly defined and defensible borders and when, in the 9th century the Rus came under sustained attack form their better equipped and better organized neighbors in today’s Lithuania and northeast Poland, a few notable victories notwithstanding, they had to flee south to the wild shores of the Dnieper river. The Dnieper, on the banks of which I had the misfortune of being born, is a major navigable river with an asterisk. It flows from north to south and spills into the Black Sea, but not before it cascades over a series of cataracts which make upriver navigation from the sea impossible even for the shallowest draft boats. This quirk of geography makes the middle reaches of the Dnieper both navigable and sheltered from attack by seaborne invaders like the Vikings. It also makes Black Sea deep water ports that more important for Ukraine. The ancient settlement named Kiev after its legendary founder Kiy, took advantage of this to find shelter on the banks of the great river and it is to that place that the now thoroughly slavified Rus moved their capital, abandoning their northern homelands not to return for seven long centuries. Their choice proved to be both inspired and tragic. For over three hundred years the second kingdom of the Russians, as they were now called, prospered in the relative safety provided to it by its near total obscurity. These lands, a thousand miles south from their original home, were much more suitable for farming and the forests and rivers were no less bountiful. Kievan Rus prospered and, as often happens on a full stomach when the swords are rusting in their scabbards, began to look to spiritual matters. The Byzantine Empire, its capital of Constantinople lying not too far south from Kiev got wind of the newly rich kingdom in the hinterlands and sent the dynamic monk duo of Cyril and Methodius to see if they could get some converts to the Greek Orthodox church. That they did, creating in the process the Greek and Hebrew derived eponymously named (after Cyril) Cyrillic alphabet that is still (with some minor adjustments) used today and giving rise to the Russian cultural identity that though in deep crisis still survives today. Even non-navigable rivers prove to be of little use when faced with the largest land force history had ever seen, the Mongol horde. 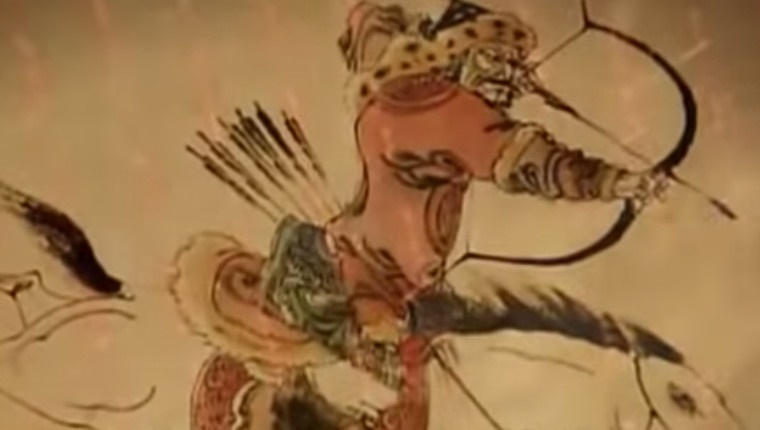 It wasn’t long after their conquest of China that the Mongols showed up at the Kiev city walls and burned the old Russian capital to the ground, forcing its princes to bend the knee. 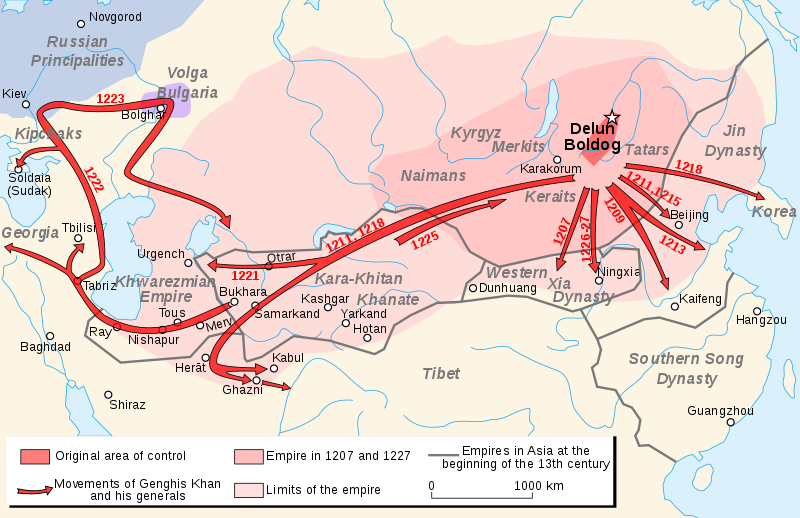 The Mongol occupation brought with it renewed uncertainty, anxiety, and longing for defensible borders. It also completed the trifecta of the Russian cultural, ethnic, and genetic identity. No longer were the Russians a truly European people, a mixture of East European Slavs and Scandinavian Norsemen; now and forever they acquired a Far Eastern element, the third element of the Russian “soul”. And so to regroup, to regain their independence, the Russian capital had to move again, once more to an even deeper hinterland, even further away from any known threats, deep into the virgin forests of the easternmost reaches of the European continent. 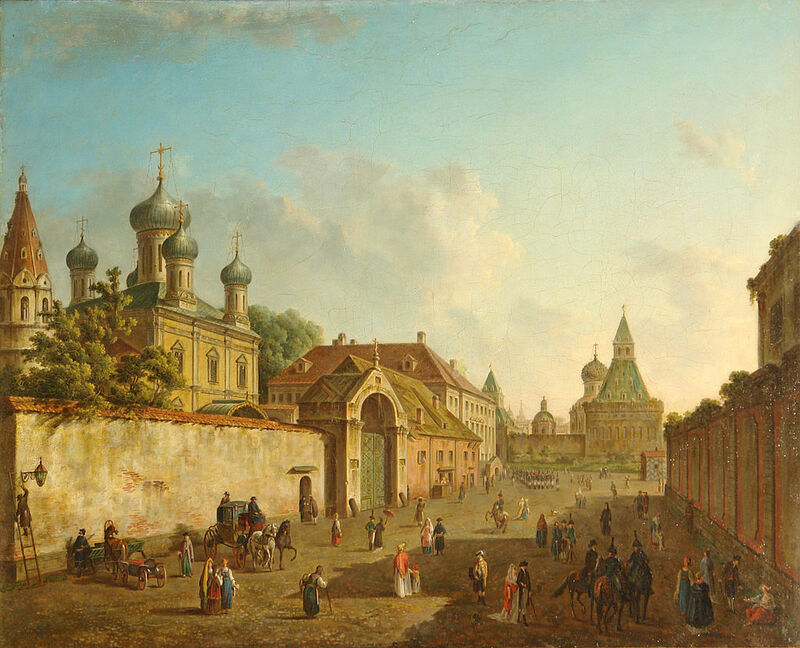 Thus was the city of Moscow founded. It was by design a remarkably unremarkable place; in the crook of a godforsaken river from which the city took its name, a river that nobody could even dream to navigate with anything bigger than a small fishing skiff. 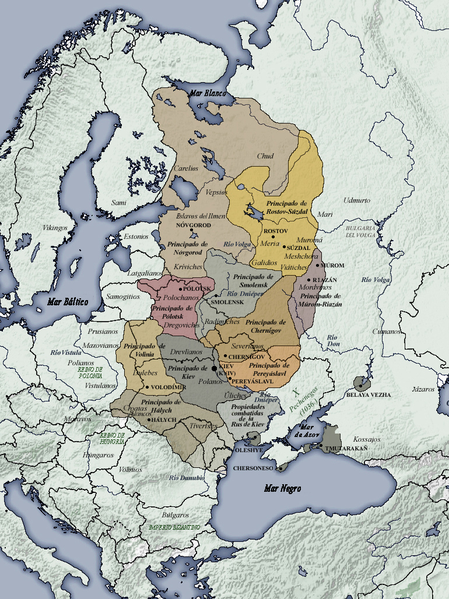 Surrounded by dense forests and hundreds of miles away from any foreign power center, the Russians were able to prosper and become rich on the fur trade with Western Europe, now fully in the throes of the Little Ice Age. With prosperity came sufficient military might to fend off the dying Mongol empire and start reversing their territorial gains in Eastern Europe and in Asia, eventually pushing them all the way east to the shores of the Amur River, the traditional northern border of the Chinese Empire. By pushing east, the western flank of the Moscovites became undefended, and their erstwhile capital, the birthplace of their culture, the holy city of Kiev fell into obscurity, soon to be conquered by the Catholic Poles and Lithuanians. This neglect, this eastward orientation of the Kingdom of Muscovy reverberates in the halls of power today perhaps more than ever before in history. The Russian neglect of their first capital, their failure to defend it from the forces of Western Europe in the 15th and 16th centuries forged what we know today as a separate Ukrainian identity, a Ukraine that is separate from Russia, that sees itself as the rightful heir to its Slavic Orthodox Christian identity, as the guardian of the true European Rus. Geopolitics abhors a vacuum and as Muscovy’s riches became the stuff of legend after the much publicized embassy bys the Russian court of Czar Ivan the Terrible to the court of Queen Elizabeth I in England, the second Nordic invasion of the Slavic homelands began when Sweden, then (perhaps surprisingly) one of the most militantly aggressive European powers began harassing the Muscovite kingdom across its wide and virtually undefended western border from the Gulf of Finland to Southern Ukraine. These western pressures culminated in a brief loss of Russian independence in the 17th century when Moscow was ruled for a few decades by Polish princes. Regaining independence, after a time of troubles, Russia’s assembly of the nobility, the merchants, and the peasants chose one of their own families, the most milquetoast one, the one least unpalatable to the real powerhouses of the day, to assume the throne in the Third Rome, the Second, Constantinople, having just fallen to the Ottomans. That family were the Romanovs. Assuming the Russian throne in 1682 at the tender age of 10, Peter I (the Great), the most famous of the Romanovs and the last genetically pure one, understood that Russia had to westernize, modernize, or die. With brutality only matched by his devoted follower Joseph Dzhugashvili (Stalin) more than two centuries later, Peter dragged Russia into the Age of Enlightenment. Or at least he dragged the ruling elites. His brutality and genius paid off. In 1709, near the Ukrainian city of Poltava, Peter, at the head of the newly revamped and reimagined professional Russian army utterly defeated what was then considered the best fighting force on the European continent, the Swedish expeditionary force under the command of the brilliant and hitherto undefeated King Charles XII. King Charles himself was gravely wounded and fled the battlefield in disgrace, never to lead an army again. Swedish days as a player on the European stage were over forever. But it wasn’t only Sweden that was defeated at Poltava, so were the Poles and more significantly, a force of Ukrainian Cossacks under the command of Hetman Ivan Mazepa. The Ukrainian strongman, whose main goal was to retain a degree of independence for his people, had to place a bet; would he go with Peter who had just a few years back lost a major engagement to the Swedes at the Baltic fortress of Narva, or the toast of Europe, the undefeated Swede? His gut may have been in the right place, because at first Mazepa pledged his support to the Russian monarch, but in the end cold calculation prevailed and he betrayed Peter, throwing his support behind Charles and the armies of the West. This disastrous (from the perspective of Ukrainian independence) bet subjugated Ukraine to Russia from 1709 to 1991, with only a brief period of independence during the years of the Russian civil war between 1917 and 1921. Poltava was the third founding, and the second one on Ukrainian soil, of Russia as an independent polity and a player on the world stage. If the founding of Kievan Rus in the 10th century established the unique Russian cultural and religious identities and its re-founding in Moscow the 15th and 16th centuries gave it its eastward expansion and Asian orientation, the Swedish, Polish, and Ukrainian rout in the Battle of Poltava in early 18th century established Russia as a major WESTERN power and guaranteed its independence until the present day. Though it took nearly two decades to be formally recognized, the Russian Empire, which in a different form is still with us today, was founded in Poltava. So was the difficult, distrustful, and often violent and exploitative relationship between Russia and Ukraine, a relationship that is on the verge of plunging the world into a major armed conflict at this very time in history. 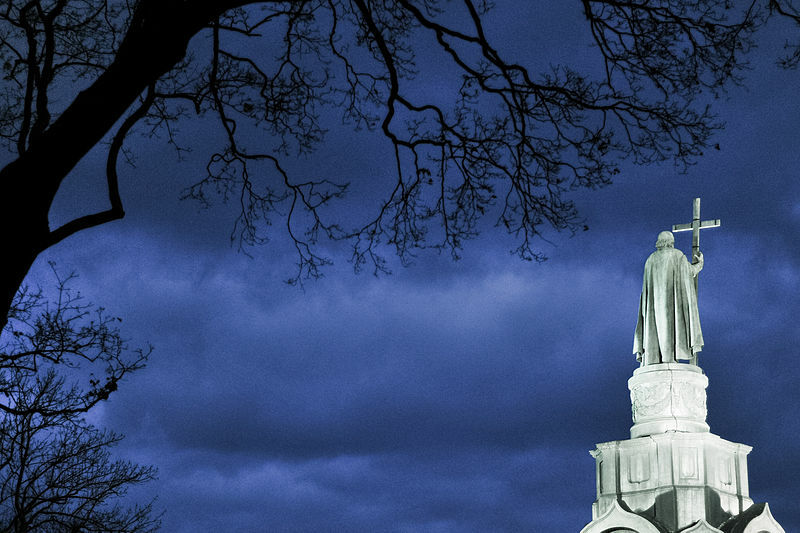 As summarized in 1829 Alexandr Pushkin’s epic poem “Poltava”, the Russians could never forgive Mazepa’s betrayal. Obtaining full control of Ukraine, they proceeded to enslave its population, annihilate most of its native nobility whom they suspected of pro-western bias, and divide the enormously rich agricultural lands of this vast country among the hereditary Russian nobility. Up to the last day of the Russian empire in 1917, many Russian nobles were drinking and gambling away in Biarritz and Monte Carlo the proceeds of the vast farms they owned in the Ukraine, farms they had never visited and that were run by Jewish overseers who they knew would harbor little if any sympathy for the Ukrainian peasants tilling the soil. In contrast today, Ivan Mazepa is a legendary figure in Ukraine, celebrated as a Ukrainian nationalist and freedom fighter. To the Ukrainians, Russians (Moscovites as they tend to call them, intimating that they, not Russians, are the true heirs to the ancient Rus culture and name), are vicious conquerors and exploiters. To the Russians, Ukrainians are traitors, always preferring the Catholic and Protestant heretic West to true Orthodox Christianity and forgetting the blood Russia had so amply spilled to protect them from Nazi occupiers. Russians, with great historical accuracy, accuse Ukraine of extreme bigotry against Jews, collaboration with the Nazis during WWII, and current glorification of said collaborators. To Russians, in whose DNA there is a deep fear of living in a hostile world with poorly defensible borders, to a people who had to relocate its capital from Novgorod in the north to Kiev in the south, to Moscow in the east, all to avoid being overrun by aggressors whether from the East or from the West, the only defense against enslavement is control of vast buffer territories, lands in which rearguard action can be fought and won, just like it happened with the two great Western invasions into the Russian homelands: by Napoleon in the 19th century and Hitler in the 20th. Ukraine, as it very name suggests is the original Russian buffer territory. Failing to gain control of it immediately after the establishment of the Moscovite Kingdom nearly cost Russia its independence when it fell to the Poles. Occupying Ukraine early in the 18th century enabled Russia to not only put aside fears of collapse, but become one of the world’s premier powers. 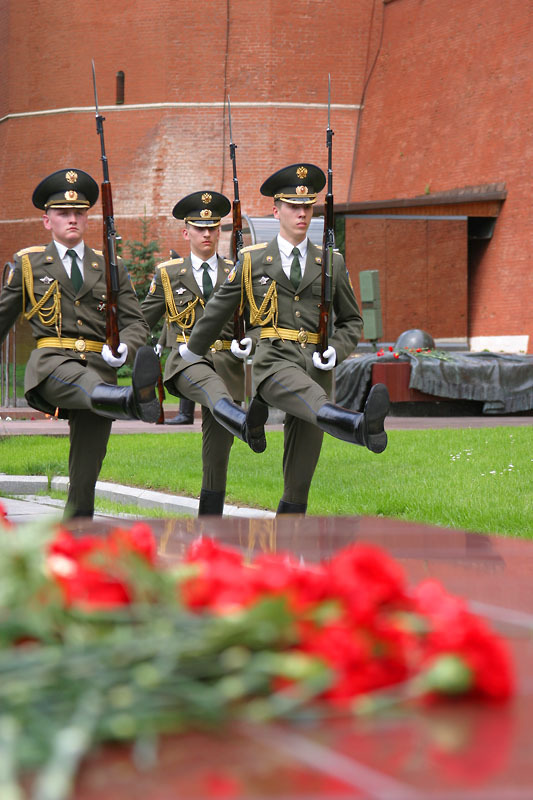 Russia’s defeat in the Cold War, resulting as it has in the loss of all of its eastern buffer territories including Ukraine was a colossal blow, the likes of which it hasn’t suffered since the burning of Kiev by the Mongols in the 13th century. Any Russian leader, no matter his or her name, would be betraying the Russian people had they not done their utmost to regain these territories starting with Ukraine. This is precisely what Vladimir Putin is doing and will continue to do. Anything more than token independence for Ukraine is simply unacceptable to Russia. As to Ukraine, well, it has a complex history replete with backwardness, bigotry, corruption, betrayal of its people by her own elites as well as outside forces, and the curse of being forever caught in the vise of deadly enemies: Russia in the east and Germany (or its predecessors) in the West, both of which view it as utterly inferior, subservient, and good only as provider of convenient battlefields and the blood with which to irrigate them. This history has resulted in few precious opportunities for true independence, among which the current one is by far the best. This is why neither Russia nor Ukraine have the slightest desire for peace or accommodation. The terms for this simply do not exist. History, more often we’d like to believe, places us in “it’s us or them” fight to the death scenarios. It is a mistake to think that they are either rare or avoidable. Or rather it is a privilege of countries that, like the US, are protected by vast oceans from any conceivable enemy. The rest of us, Israelis and Arabs, Russians and Ukrainians, who are not similarly blessed must duke it out till one of us is utterly destroyed. It may take decades or even centuries, but make no mistake, in these battles winner takes all.